The lead character, Honor Harrington, is often called a female Horatio Hornblower. Like that daring hero introduced by C. S. Forester in the 1930s, she went from the bottom to the top of the Navy she serves (albeit millennia later), and she has earned a legion of devoted followers through the 13 preceding episodes of the series. 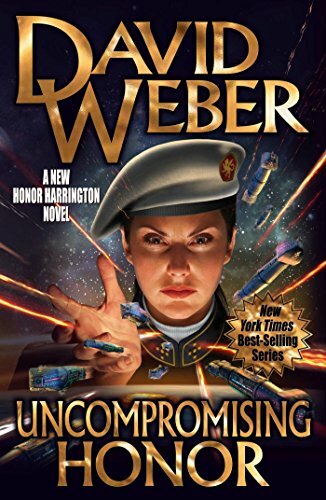 The “Honorverse” that’s evolved around her has spun off sub-series and anthologies, written by the original author David Weber as well as Weber in conjunction with others. Their combined output is staggering—as is the length of this volume. Few novels of such scope are published these days. Uncompromising Honor is worthy of note for physical size alone. For the record, the review copy in 6"x9" paperback is almost two inches thick, weighs almost three pounds, and runs just shy of 800 pages. Easily, two or three “normal” size novels would fit into these specs. One can only imagine the outline that must be needed to assemble a book of such heft and complexity—not to mention the intellectual brilliance needed to conceive and compose that level of plot/character/story. Too bad readers can’t see the outline, or at least receive a cheat sheet along with the novel, for there are so many people and changing viewpoints, so many ships, so many planets and star systems, so many back references to so many previous adventures, that it’s darn near impossible to keep track of it all. But this trait is characteristic of the entire series, and it works because each book contains food for multiple tastes. Uncompromising Honor, because of its scale, provides a feast. Readers who love military science fiction will get enough hardware-geek stuff and space battles to make their palms sweaty. Those who love political intrigue will nigh have their brains explode from following all the tentacles of strategy, tactics, and conflicting human interest at play. Those who love fully drawn characters with everything at stake, who reach deep into themselves for heroism, and who outmaneuver their enemies—especially when they’re outnumbered and outgunned—will have lots to cheer about. And those who love bad guys committing atrocious deeds, only to get what they deserve from the good guys, will sleep contentedly at night because justice has been served. For readers who love all of it combined, Uncompromising Honor will provide a long, luxurious trip into another world that’s hard to drag one’s head back out of. Readers who like only a particular aspect can still be entertained and intrigued by skipping what doesn’t work for them. This book is big enough for everyone. It brings together many storylines from the series into a dramatic climax. Some folks expect it to be the series finale. Only the author knows for sure. Despite the author’s mastery in writing this novel, however, it contains one critical flaw: It’s billed with trumpets as a Honor Harrington novel, yet the percentage of time Honor spends on the page is disproportionately small. The imbalance makes sense in the “Honorverse” context but is dissatisfying for people reading because they love Honor. They will have to plow through long runs of pages that have nothing to do with her to get their fix. She comes into focus and dominates the action in the final section, and lives up to all we expect of her, so the conclusion is satisfying. But this approach makes the new mega-volume not the right one to read as entry into the series. Better to start with volume 1, On Basilisk Station, and read at least the next two or three; ideally, the full series. Then Uncompromising Honor will provide an emotionally and intellectually gratifying fictional experience.